I had a paperback storybook when I was a young girl about a circus. It had my name and likes in it. I still have it to this day as it was such a special book to me! Kids love to see their names in books!! What is great about this book is each letter of the child's name represents a different sea animal to learn about! Depending on how long your child's name and variety of letters, dictates how the book is made. Add in a bandana with your Pirate Tale for an added thrill! 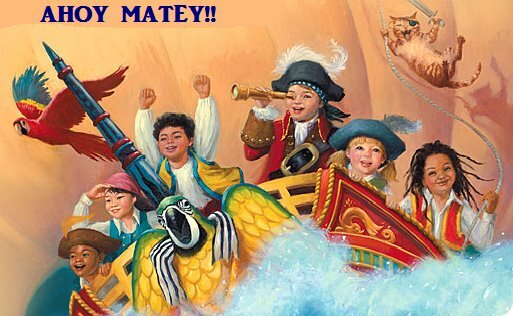 "In My Very Own Pirate Tale, entertaining sea creatures bring letters one by one to spell out your child's name, and they describe why he or she is the perfect candidate to be the captain's first mate. The sawshark brings the S, the octopus brings the O, and so on. At the end of this adventurous pirate story, your child's name is revealed as the secret to opening the treasure. Includes an illustrated encyclopedia of 62 sea creatures with fun facts about each. Filled with beautiful, hand-painted illustrations, this hardcover book is a unique keepsake that will be cherished for a lifetime. I think My Royal Birthday Adventure for boys would be a big hit too! I think A Monster in my Closet would be cute! But, I'm a monster maker, sooo! Who Loves Me? looks like a sweet book. the The Super, Incredible Big Sister book looks cute too! Who Loves Me For Siblings. i like "the world according to me"
The Super, Incredible Big Brother looks great. My daughters would love My Very Own Fairytale!